Hope you enjoyed the cards today! As always, thank you so much for stopping by! Tomorrow we will be highlighting the last of the November release! Go check out the rest of the Mama Elephant gals to see their wonderful On Target projects! JJ these are super cute! I love the bullseye! wow!! love the first card, with the die cut and arrows! so fun!! but the 2nd card is STUNNING!! love that gold embossing powder!! i never thought of myself as ever wanting gold, but you've sold me!! it just looks so amazing! I love the bright colors you used! And gold embossing?? Yes, please! ;) I love arrows, this set looks super fun! JJ.....I am just constantly wow'd with your designs! I love that first card....so CAS and perfect! EEEK!! I love them both JJ! All the colorful arrows (PERFECTLY SPACED - HOW DID YOU DO THAT?! 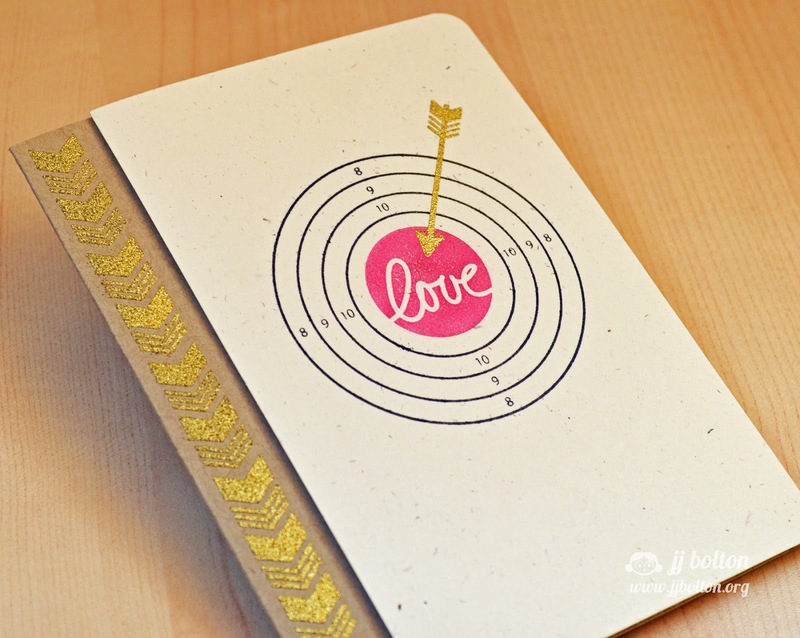 )pointing to the XOXO and the second with the gold embossing and target! You've got me totally thnking Valentines now! I can see these on guy cards too ... I'm thinking camping / archery.. AWESOME samples - I want these too!! Great cards JJ! Love them both, you are a master! The gold embossing is perfect! JJ the target is so cool and you made two amazing cards with it! sweet cards...love the way the arrow heads are all different and the use of gold embossing powder on the last. i always love your work, JJ! JJ I dont know how you do it … I just love to see your creativity. Both amazing! These are seriously fabulous! Loving those arrows! I am loving this set so far... and you're the first one I've visited! TFS! Wow! These ate awesome. I love the arrows. Too cool JJ! I love all the colored arrows stamped so perfectly! Oh wow!! 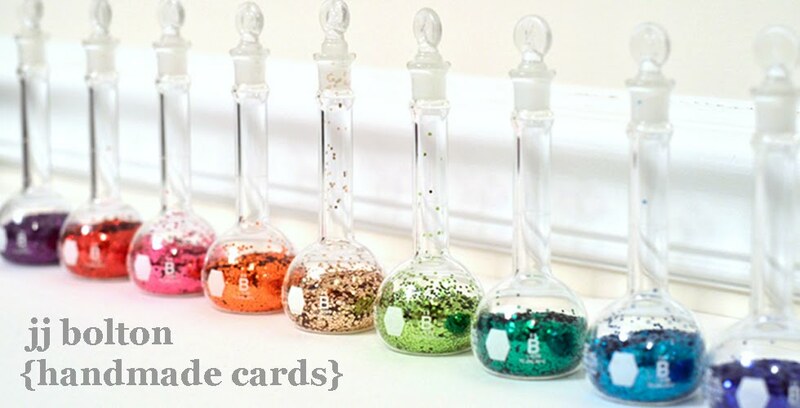 Awesome cards!! I just love the second card!! Wow. I just love that chevron border. And the gold on kraft looks fantastic! wow, the gold foiling is great! ADORE these!! LOVE this stamp set...can't wait to get my hands on it! *thud* I am in awe of your cards, JJ! That second one shoots an arrow to my own heart! What perfect "LOVE" cards. Great design. Cute. Like the bullseye. Thanks. wow! I just have to say your work always amazes me! You are so talented and so creative, what an amazing inspiration thank you! I love how you popped that top part of the first card and I love the gold embossing on the second! I love all those arrows.. so darn cute. GET OUT! You are soooooo amazing! I LOVE these, JJ! I love the colors and the design--I LOVE that all of the arrows point to the middle XOXO! I love that gold on the second card---OH MY! You knock my socks off! LITERALLY! Two amazing samples, the graphic design of these are outstanding. The gold embossing on the second intrigues me. This set is so funny & creative ! Full of surprises for this month's release, can't wait to see the full reveal on the 15th ! Great design on both cards! Two great cards. I really love the first one with the arrows. Thanks for the inspiration. The gold embossed chevron is what caught my eye on this fantastic card!! That and the little gold arrow! I love this set!!!! Just when I think you couldn't possibly impress me more ... holy cow these are fantastic!!! The arrows on the first card are devine with the cut out semicircle. Super trendy & fun! Love the cut out on the first (and that fab alternating arrow designs!) and the target? Just awesome! LOVE these Creations JJ So Perfectly Fun! Love what you did with this set! These are both fantastic!! I love those arrows arranged around the "love"! Perfect! Amazing colors on the arrows - very pretty! I love the gold touches on the arrow and on the side of the card. You make beautiful cards. The first one is amazing. I love the different points on the arrows! OH MY GOSH!!! I love that first card!! Okay, these are both fabulous but that first card with the arrows and the cut out is SPECTACULAR! I haven't had a chance to ink up the set I won last month from ME, but I'm already putting this one on my wish list! 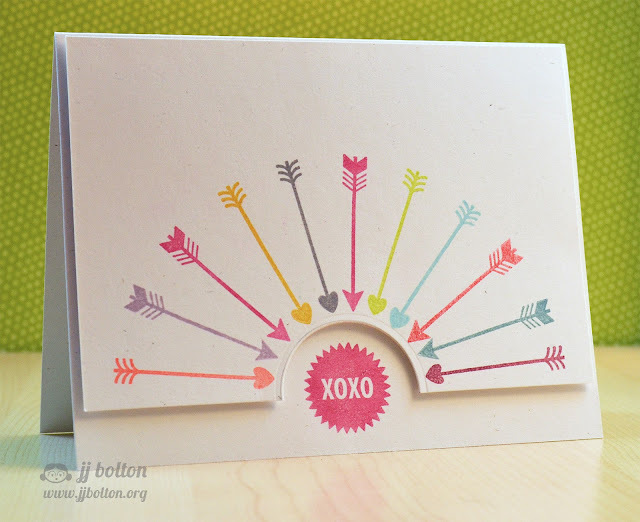 I love the multi-colored arrows and especially the fab gold embossing!